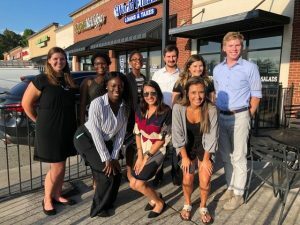 On September 30th, 2018 two Education Abroad Advisors accompanied seven Education Abroad Interns and Alumni to Carrollton, GA, where they attended the Lessons From Abroad Conference. Lessons From Abroad is an organizations consisting of like-minded higher education professionals who aim to assist in the reentry process individuals experience when coming back to the US from abroad, especially those who have pursued educational sojourns. The conference kicked off with an inspiring speech by the Keynote Speaker, Vallera Gibson, who is the Diplomat-in-Residence for North Georgia, Tennessee, and North Alabama. Over the course of the day, students moved between various breakout sessions and received tips on applying for competitive programs like Peace Corps and Fulbright, learned how to make sense of their education abroad experience both in person and on their resumes, and how to navigate the job search after graduation. At the conclusion of the conference, UA students and study abroad alumni Shakerri Garrett, Madison Knapp, and Camille Carr were awarded prizes for their phenomenal photos from abroad. The Education Abroad office at UA can help students find a program that suits their degree program, time frame, and budget. To begin the process of having a life-changing experience abroad, stop by the Education Abroad office in 135 BB Comer to attend a Study Abroad 101 session and talk with an advisor. Two University of Alabama students have earned Critical Language Scholarships for the summer 2018 term. Lawrence Monocello, a doctoral student in anthropology from Erie, Pennsylvania, will study Korean in Gwangju, South Korea. Maria Huryn, an undergraduate from Tuscaloosa, will study Russian in Bishkek, Kyrgyzstan. 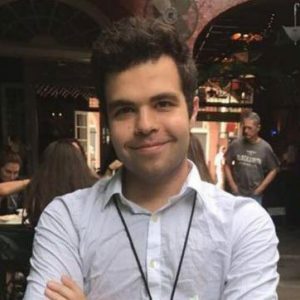 Huryn, a member of UA’s Honors College, is majoring in international studies and economics with minors in Russian and Spanish. She is involved with the Alabama International Relations Club and sings in the University Chorus. She also works as a research assistant at The University of Alabama’s Institute for Social Science Research. In the summer of 2016, Huryn participated in the UA in Spain: Language and Culture study-abroad program, and she spent the 2017-2018 academic year studying Russian abroad in Daugavpils, Latvia, as a U.S. Department of Defense Boren Scholarship winner. Monocello is studying biocultural medical anthropology in the department of anthropology. He studies how culture affects body image and the development of eating disorders among Korean men. He holds a bachelor’s degree from Case Western Reserve University and a master’s in anthropology from UA. The Critical Language Scholarship program is part of a U.S. government effort to expand the number of Americans studying and mastering critical foreign languages. CLS scholars gain critical language and cultural skills that enable them to contribute to U.S. economic competitiveness and national security. The program provides scholarships to U.S. undergraduate and graduate students to spend eight to 10 weeks overseas studying one of 14 critical languages: Arabic, Azerbaijani, Bangla, Chinese, Hindi, Indonesian, Japanese, Korean, Persian, Punjabi, Russian, Swahili, Turkish or Urdu. 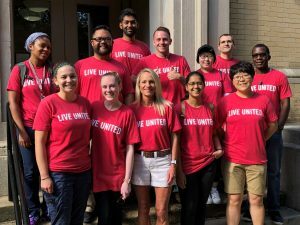 Continuing the annual tradition of serving the Tuscaloosa community, 34 Capstone International Center volunteers including faculty, staff, and students participated in The United Way of West Alabama’s Day of Action. The United Way organized 40 local service projects to assist nonprofit organizations and schools in the Tuscaloosa community. More than 500 volunteers came together for this year’s Day of Action to improve the community where The University of Alabama calls home. The Capstone International Center volunteer teams spent their day at the Tuscaloosa Metro Animal Shelter, The Arc of Tuscaloosa, Temporary Emergency Services, and Stillman College. The team completed much needed yard work projects, painted dorm rooms, organized donations, folded laundry, engaged with the community, and learned about local organizations working to make a difference. One of these United Way agencies, Temporary Emergency Services, has been in the Tuscaloosa community since 1945 helping individuals and families in crisis situations by providing financial and other temporary assistance. T he United Way of West Alabama strengthens education, income stability, and health in our community by developing resources and partnerships. 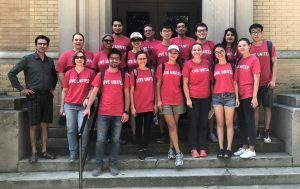 The Capstone International Center is honored to participate every year in the service opportunities that the United Way organizes in the community. Sharing our love of service with UA’s International students only strengthens our relationships! 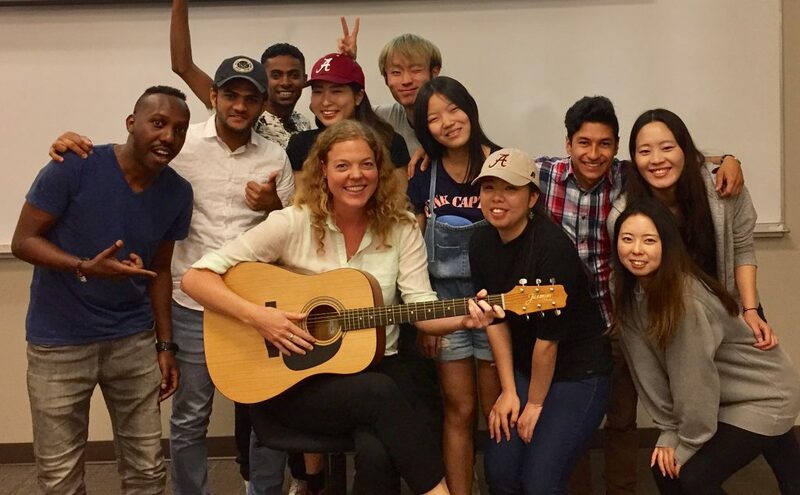 The University of Alabama’s English Language Institute has begun its second year as a partner with Kansai Gaidai University (KGU) in Japan. Several of the UA’s ELI faculty are providing a range of academic English courses for 100 Japanese students each year on site in Osaka. Courses include English-language skill courses, as well as content-based courses on global issues, world religions, and current events. 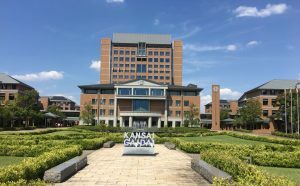 Kansai Gaidai University is a private Japanese university known for its focus on foreign languages, study abroad, and Asian Studies programs. The students enroll in the UA@KGU program in order to study abroad during their second and third years. Many graduates pursue careers in hospitality and hotel management. 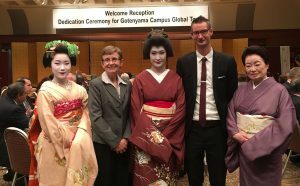 The first ELI@KGU classes began in April 2017 and the offerings from ELI will continue through at least 2019. This continues a long association between the UA and KGU. The UA has been hosting international exchange students from KGU for nearly two decades. TUSCALOOSA, Ala. — For the 2018–2019 competition period, 15 University of Alabama students have been selected for Fulbright Awards. The University of Alabama is a nationally ranked Top Producer of Fulbright Student Award Winners. Two University of Alabama students received Fulbright Awards for research and study during the 2018–2019 academic year. Natalie Kidd of Birmingham, a graduate in biochemistry will conduct research titled “Modulation of Regulatory/Suppressive Actions of Gamma T-cells with a Chimeric Antigen Receptor (CAR)” at the University of Kiel’s Institute of Immunology in Germany. Thirteen UA graduates received Fulbright Awards to serve as English teaching assistants overseas for the 2018–2019 academic year. Rachel Combs of Florence, a graduate in political science and German, will teach in Germany. Jeremy Connor of Huntsville, a graduate in music performance (woodwind and percussion) and a current master’s student in German linguistics, will teach in Germany. Carrigan Fain of Gardendale, a graduate in international studies with a minor in Spanish and captain of the UA women’s softball team, will teach in Malaysia. Dwyer Freeman of Haddonfield, New Jersey, a graduate in German language and literature with a minor in critical theory through social study, will teach in Germany. Maggie Holmes of Madison, Mississippi, a graduate in biology with minors in Spanish and psychology, will teach in Spain. 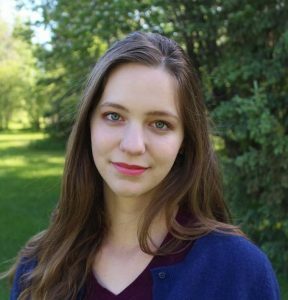 Madeleine Lewis of Huntsville, a graduate in religious studies and applied mathematics, will teach in Montenegro. Richard Lewis of Birmingham, a graduate in English with minors in social innovation and leadership, business, and creative writing, will teach in Malaysia. Taebryanna Sims of Mobile, a graduate in international studies with language study in French and Korean, will teach in South Korea. 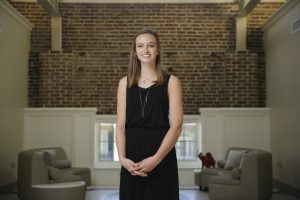 Shelby Smithson of Mobile, a graduate with a bachelor’s and a master’s in social work and studies in the Turkish language, will teach in Turkey. Theresa Stoddard of Eads, Tennessee, a graduate in interdisciplinary studies, global inequities and human rights, and Spanish, will teach in Spain. Kaylyn Williams of Hoover, a graduate with a bachelor’s and a master’s in accounting, will teach in the Czech Republic. Amanda Wolosz of Midland Park, New Jersey, a graduate in economics and finance with a minor in history, will teach in Poland. Annika Wulff of Army Joint Base Elmendorf-Richardson, Alaska, a graduate in communicative disorders and German language and literature, will teach in Germany. Students with an interest in next year’s competition are invited to learn more about the Fulbright Program by contacting the Capstone International Center, 135 B.B. Comer Hall, cic@ua.edu or beverly.hawk@ua.edu. The Education Abroad office will hold the final event for the spring international exchange students. We will be celebrating their time here with pizza and tie-dying t-shirts on Friday, April 27. In attendance will also be the Education Abroad Interns who are returned American study abroad students who have been involved with the exchange students and their activities throughout their stay at The University of Alabama. While the group this semester has been small, they have been incredibly active and engaging. 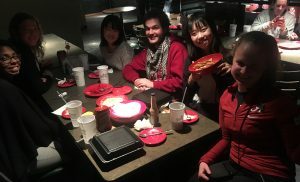 The international exchange students are a group of students from all over the world who come to UA to study for either a semester or an academic year. The University of Alabama currently has partnerships with over thirty different foreign institutions where we swap students each semester. A great benefit for these students and ours is that each student will pay their normal tuition rate at their institution in order to study abroad. This semester we were fortunate to have students from France, Japan, England, and Taiwan experience all that Tuscaloosa has to offer. In mid April, the University of Alabama hosted the 2018 Alabama Association of International Educators (AAIE) annual conference. This organization is the Alabama chapter of Association of International Educators (NAFSA), and holds at its core a mission to promote international educational and cultural exchange through the support of students and scholars who choose to study in the state of Alabama and of Alabamians who seek education abroad. Approximately 120 professional staff from international education offices across Alabama attended. Presentation topics covered a range of topics including using technology in the office and creating culturally inclusive programs for students from different countries. The University of Alabama’s staff presented on eight different topics . Participants also enjoyed a keynote speech by Mr. Mark Jackson, Honorary Consul General of Japan, who stressed the importance of diverse cultural knowledge and travel. More information about AAIE, its mission, and events can be found at http://aaieorg.blogspot.com/.